Featuring parameterized triggering and real time frequency analyses. 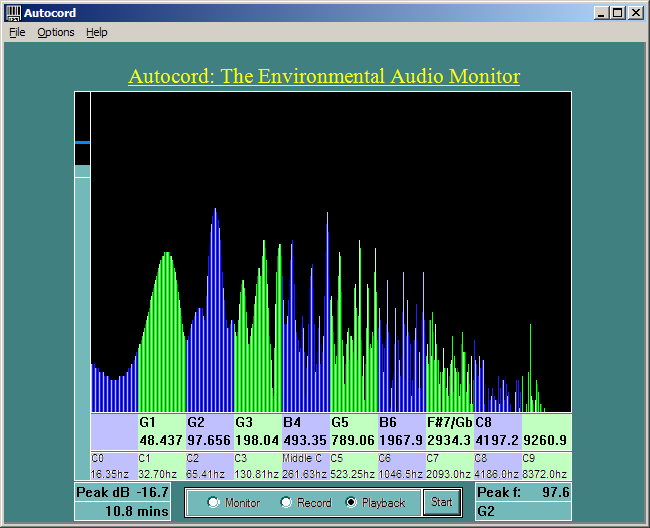 Monitor audio in the environment for hours and even days on end, while only triggering on sounds of interest to record to disk. Triggering can be specified by signal amplitude and frequency range. A real time frequency analyses graph is presented while monitoring, recording, and during playback to display the spectral characteristics of what is being heard. A sample rate of 32k is employed, providing up to 16 kHz of frequency range. The 16 bit resolution provides over 90 dB of amplitude range. A simple computer microphone is all that is needed for monophonic recording. Audio is recorded directly to mp3 to economize disk space. Beyond the ability to immediately play back what was recorded, almost any mp3 or wave file can be played for real time frequency analyses. Musicians and aspiring musicians will appreciate the fact the predominant note of the Even Tempered Scale is displayed for each octave where a frequency peak is identified within the confines of plus or minus one eighth of a semitone (within about 12 cents). The actual frequency value of each identifiable peak in each octave is also displayed. Beyond this, the vertical lines that make up the graph are colour coded such that the lighter the colour, the closer the frequency is to one of the semitones of the Even Tempered Scale. The graph represents 10 octaves from C0 at 16.35 Hz through the last octave beginning at C9 (8372.0 Hz). Each octave is dived into 48 parts, so each vertical line represents an ‘eighth tone’. The loudest note and frequency of the entire 16 kHz range is displayed separately for added convenience, along with a peak amplitude meter calibrated in decibels (on the left). Autocord stands for Automatic Recorder. What makes Autocord so special for recording is that it is voice triggered, not only by amplitude, but also by frequency. You can set it to trigger recording on, for example, when the sound level reaches 3 dB over the ambient noise level. You can go beyond that, and tell it to only trigger if the frequencies in the audio picked up by the microphone are between say - 120 Hz and 600 Hz. You can do dictation for hours using the voice activated trigger, and never have to edit the audio file after. Sounds are recorded from half a second before the triggering event, to half a second after, so as not to chop up what you are recording. Conversely, you can set the threshold to -90 and the frequency range to 16 to 16000 (the default frequency range) to record continuously. The idea is that you can have it running all day and/or all night, and only trigger on record when there is actually something interesting and worthwhile to record. Since it records selectively, and records directly to mp3, it will never fill up your hard drive with worthless audio files. You can test your singing voice and perfect pitch, tune and strum your guitar or play other musical instruments, and monitor in real time to see if you are on key. Autocord can be used to monitor your house while you are away. You would be quite surprised to hear what your cat has been up to. Monitor your baby sitter’s interactions with the baby when you go out in the evening. Do you snore, or talk in your sleep? Don’t know because you never managed to stay awake long enough to find out? Place a microphone by your bed and set up Autocord to run all night, and to only trigger when the audio level is something actually audible. Are you a bird watcher and want to record their songs? Leave Autocord running all day while you are at work, with the microphone directed out the window, and the trigger set to the frequency range of the bird calls you want to catch. Don’t know what these frequencies are? That is why Autocord has a monitor-only mode. Set it into this mode, and watch the spectral display to see what frequencies peak up when that bird chirps. You can have it always running while you work, and make notes hands free – just speak up, and it’s recorded. When you stop speaking, it stops recording. You can also set the frequencies to trigger only on your voice, and not that of the wife or the kids. The thin white band you see on the VU Meter is the trigger level, set via the Options Menu or by simply mouse clicking within the bar of the VU meter. When the amplitude of the audio reaches that threshold, and is also within the frequency range specified via the Options Menu, you are recording. Finally, I have a notion that this software may be useful to a deaf person. Being gifted with normal hearing, perhaps I could be forgiven for making such a presumption. I am sure that the deaf and hard of hearing have abundant access to great technology these days, and I have done no research on the subject. However, I couldn't help noticing that when running my audio monitor frequently, while watching the spectral display, that it took me no time at all to be able to identify common sounds in my environment by their spectral signature alone. Even when browsing the recording log, it was easy to identify exactly when the phone rang or the refrigerator clicked on. I can't help but imagine that it could be useful for a deaf person to have a visual representation of the soundscape around them. A log file is generated while you record, identifying each event that triggered recording on by frequency and amplitude. These events and the filename for the mp3 created are labeled with a date/time stamp so you will know to the second when a file began or an event was triggered. The format of this stamp is: [MMDDHHMMSS]. Accumulated time and file size is displayed at all times while recording. During playback, any file loaded will loop forever, or until you stop it – whichever comes first. This helps a bit to make up for the lack of ability to navigate to a random point within the file in this first version. On playback, if the sample rate of the file loaded is not 32,000 samples per second, interpolation is employed for real time conversion to the frequency required by the 16,384 point FFT. The frequency spectrum is displayed at a rate of 30 frames per second. With the FFT, mp3 encoding/decoding, and interpolation, there is a lot of heavy number crunching. It would be best to avoid running other intensive processes in the background while Autocord is running. Check this demo out, and let me know what uses you have found for it. I would also appreciate learning your opinion on whether a commercial version of this software would find a market for itself, and what added features it should have.